It only seems fitting to come back on trend. Culottes: a pants/shorts hybrid once fabeled to be more rare than a skort pre-2011, is now this season's must-have bottom. Obviously this is also old news, but I am just getting back so forgive me! Trend-wise these pants feel do-able. They kind of look like the also trendy midi skirt, they hide fupa, *and* I can make really awkward stances whilst singing "Drunk in Love" (more specifically "SURFBOARDT"--see above photo). A win-win if you ask me. 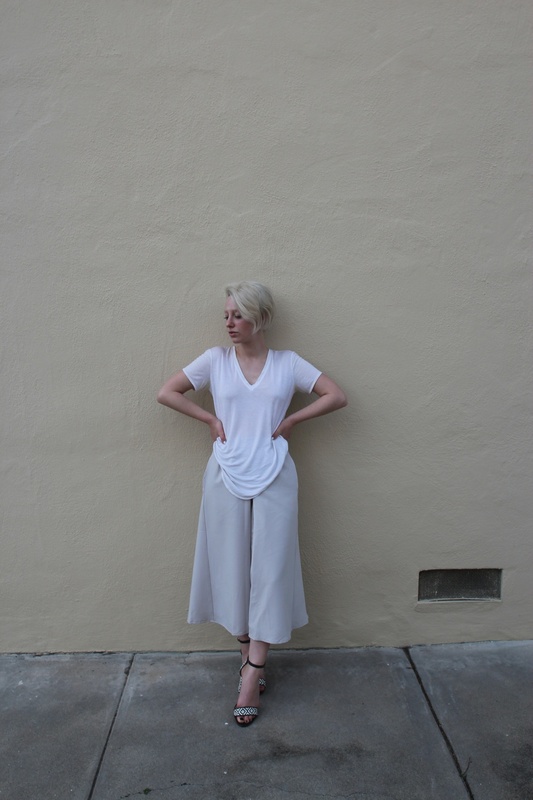 I've already styled these culottes a few different ways. Here I opted for a Helmut tee because most days I really can't be bothered to care more than this. Luckily the whole draped look really worked in my favor. Finally, I finished things off with lots of rings and a pop of print with last Summer's "it" Zara sandal. Voila!